Wen has spent the first eleven years of her life at an orphanage in rural China, and the only person she would call family is her best friend, Shu Ling. When Wen is adopted by an American couple, she struggles to adjust to every part of her new life: having access to all the food and clothes she could want, going to school, being someone's daughter. But the hardest part of all is knowing that Shu Ling remains back at the orphanage, alone. Wen believes that her best friend deserves a family and a future, too. But finding a home for Shu Ling isn't easy, and time is running out . . . Finally. A novel about older child adoption. And even better, it's written from the point of view of the adopted child. I was cautiously hopeful as I began reading. Would this book really paint a picture of the challenges as well as the joys of older child adoption? Or would everything just be butterflies and rainbows? Would the story be compelling enough for kids of all ages (and even adults) to enjoy? Was that too much to ask of one book? In the end, my hopes were realized. I really liked this book. In fact, I liked it so much I decided to read it aloud to all my kids. Ages 12, 10, 9 and 8, my kids were the perfect audience for Red Thread Sisters which is aimed at middle grade students. I found it to be appropriate for older elementary kids as well. My one concern was Wenxin. Although the author, Carol Peacock, approaches the subject sensitively, when Wen and Shu Ling share their stories of abandonment, the ache of their hearts is unmistakable. I cried for them. Would this prove to be too much for nine year old Wenxin, only home from China two years? I prefaced the book by sharing with all the children that this was Wen's story (the main character), not Wenxin's. And as I read, I saw the biggest response from my biological kids. Julia, age 10, said, "I never thought before about how the adopted kid might feel." Following Wen's story, they were able to see international adoption through her eyes. Their empathy and understanding deepened. As for Wenxin, he listened, but didn't say much, and I didn't push it. I just gave him room to process, and let him enjoy the story. By the end of the book, all of us, even Wenxin, were cheering Wen on, hoping she'd find Shu Ling a family before it was too late. After reading Red Thread Sisters, I gathered up my courage and wrote the author, Carol Peacock. She is so sweet. I asked if she'd be willing to give away a signed copy of her book, and she said, "Yes!" So just in time for Christmas, you have the opportunity to win your own signed hardcover copy of Red Thread Sisters. It would make a great gift for any young reader. It would even be helpful for prospective adoptive parents. There's something about a good story that drives the truth home and helps it stick. Follow the instructions on the Rafflecopter widget below for up to 12 chances to win! If you've never used Rafflecopter before, don't be intimidated. It's super easy. Dr. Carol Antoinette Peacock grew up in Maryland, in a suburb outside of Washington D.C. She is the oldest of three children in a family who loved books. When she was young, her parents, Andrew and Gloria Peacock, read devotedly to her, her younger brother, Richard, and her younger sister, Nancy. Carol Peacock has wanted to be a writer since she was eleven. She is now a practicing psychologist and author of six books. Dr. Peacock earned a BA at Cornell University, a Masters of Social Work from Columbia University and a Ph.D. in Psychology at Boston College. You can find Carol Peacock on Facebook and at carolpeacock.com. 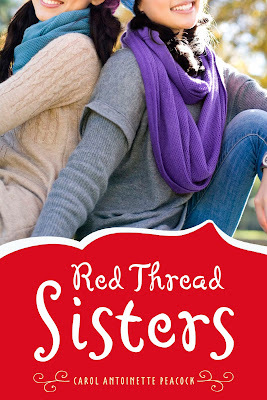 And if you don't want to wait for the raffle to end, Red Thread Sisters is available now at Amazon. Shared at the Tuesday Baby Link-up. I have two daughters adopted at ages 7 and 3 from Russia. I've been looking around for a used copy of this book.. but maybe it's too new, I can't find one. So I can't pass up the chance to get a copy free! You're right. It was just available in Oct. 2012. Any older child adoption book sounds great to me, as our adoption agency has a heart specifically for older children! Megan - You don't know how happy it makes me to see you finding homes for younger kids! Oops - meant to say older kids. Oh well - younger kids, older kids - I'm happy that you are finding homes for ALL KIDS! Haha, we do find homes for kids of all ages! We've found forever families for kids who are newborn through age 17, I believe. I'm excited for December though - we have 21 Colombian kids aged 10-15 coming for 3wks to spend time with families in a vacation hosting program and we're hoping that at least 15 will be pursued for adoption... we already have letters of intent for 4 of them so far! I placed this book on hold at our library! Glad they have it! :-) And thanks for the recommendation. Hey, you know you get an entry in the giveaway for this comment, don't you! You're going to like the book. I think my crew would definitely appreciate this story. It would be a great book to add to your library. Thanks for entering! We love books, especially about peoples lives, adoption and China. We are in the process of bringing home our 6 year son. Your blog has been extreemly helpful. Thank you for sharing about this great book. We hope to be reading it soon. Thanks Daphne! How exciting about your new son. This would be a great read! Oh please pick me! This is the perfect Christmas for my 13yr old! I'm so excited to check it out. I'm wondering if this book will hit too close to home at our house. We brought home an older girl whose Chinese name is Wen and she asked us to adopt her friend who only had 2 months until she turned 14 (we were only home 2 months at that point). We couldn't do it and even though our agency tried to find a family she eventually aged out. Sandra - it may mirror Wen and Lucy's story too closely. You could read it first and see what you think. My personal opinion is that this book is even more valuable for non-adopted siblings and adults connected to an adopted child because the story is told from Wen's perspective. Just re-read this and saw that the girl Wen asked you to adopt was not Lucy. My gut feeling is that this book would be too traumatic for Wen. Love this! Thanks for linking up with the Tuesday Baby Link Up! I'm off to enter! Thanks so much to all of you for your wonderful comments about my book, Red Thread Sisters. And thanks, Dana, for spreading the word about my book. If you didn't win the free book, do ask your library to buy more copies! My warmest, red-thread wishes to you and your families.